Apparently honeybees are able to solve the famous travelling salesman’s problem. No need to paraphrase this amazing article from the Guardian. We definitely have so much to learn from bees. You will be happy to read that US scientists are making progress regarding the Colony Collapse Disorder (CCD). Two articles about this : New York Times and Popular Science. For those who read French, you can see comments in the French press on slate.fr and le Figaro . It is a progress, unfortunately, it is not the ultimate solution. There is still a lot of work to be done. The good news is that more and more scientists are working on the CCD. The fact that the US army allocates some of its resources to bees is significant. The bad news is that the result of this research work is not a big surprise. 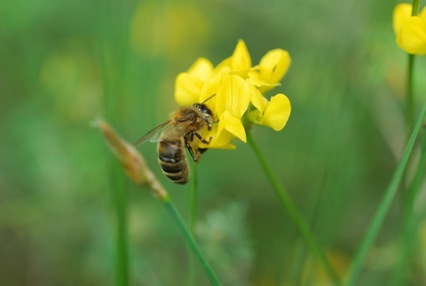 At the end of the day, it is highly positive : science is doing progress, the means deployed for bee research are increasing and it appears that the different laboratories are collaborating efficiently, including French INRA. A very interesting experience presented by the Guardian. This experience is very encouraging, first because reintroducing species can work, but also because it shows that recreating favorable conditions is beneficial to the target bumblebee but also for other wild bees. Agricultural practices influence environment, unfortunately it is often negatively, this experience shows it can be positively.